Why do you train with your trainer? 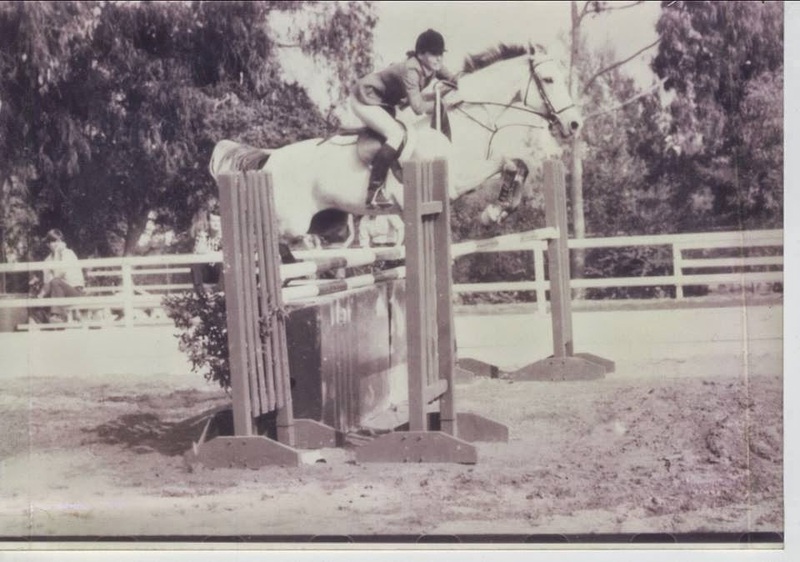 If okay or possible, share a picture of your trainer riding. I’ve been riding with my trainer since December 2010. Overall I think we are compatible in teaching/learning styles, and we are very like minded when it comes to horse care. Laurie schooling a client’s horse. She’s affordable. I get 2 lessons a week, and for less than the average cost according to PWS’s recent survey. She’s available. I get my weekday lessons at 6:45 pm, with day of the week depending on our mutual schedules. Not many trainers around here offer that kind of flexibility. She still rides. I love that. 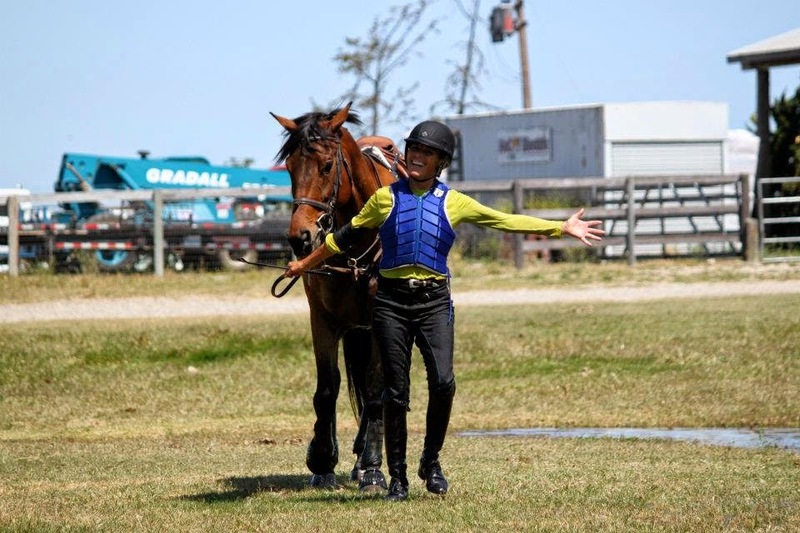 She also attends clinics occasionally, and comes back revved up for lessons. 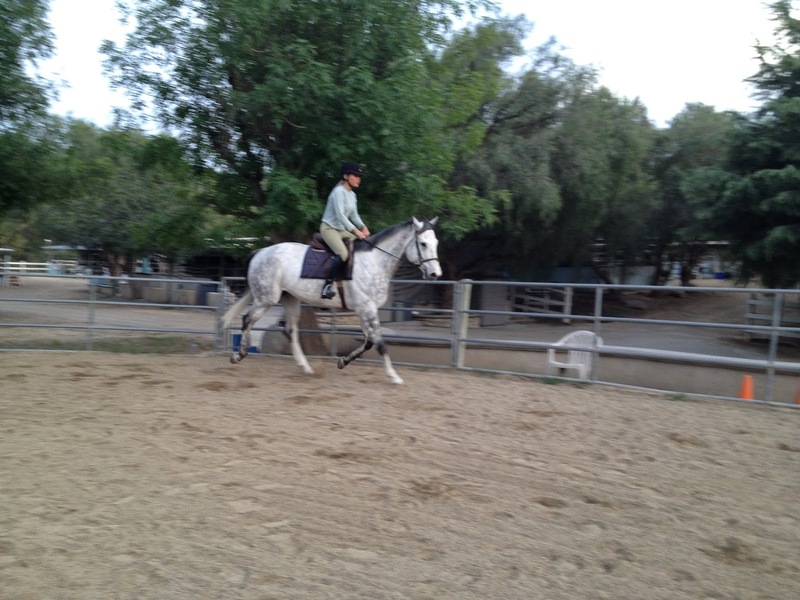 Laurie riding Handsome last week. He’s the newest OTTB in her program. Her overall philosophy is form fits function and that being effective is more important than being attractive. This helps me feel more empowered in training Hemie, like I have more tools in my tool belt than other riders have. She loves all aspects of horses and riding. She has taught me to love dressage. 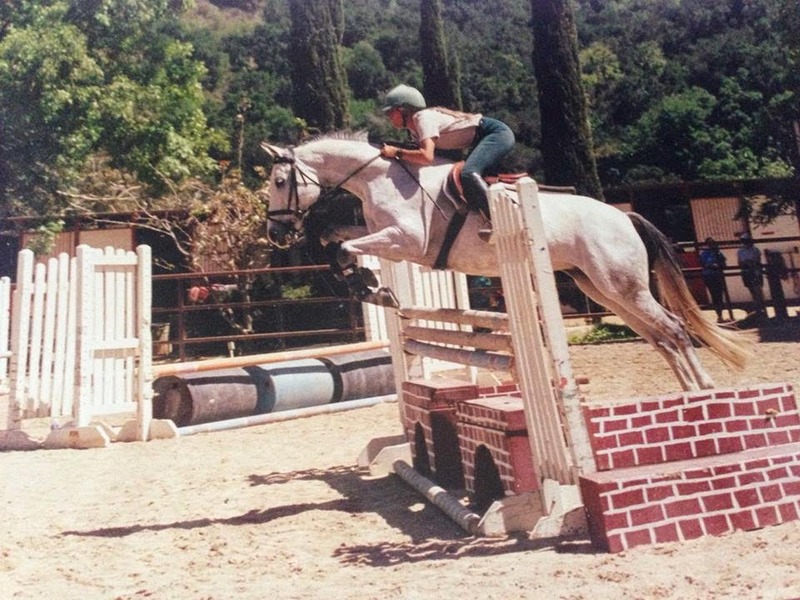 She has experience with racehorses and with retraining OTTBs for eventing. She has a relationship with a rescue group, and her efforts have helped many horses get new homes and careers post racetrack. 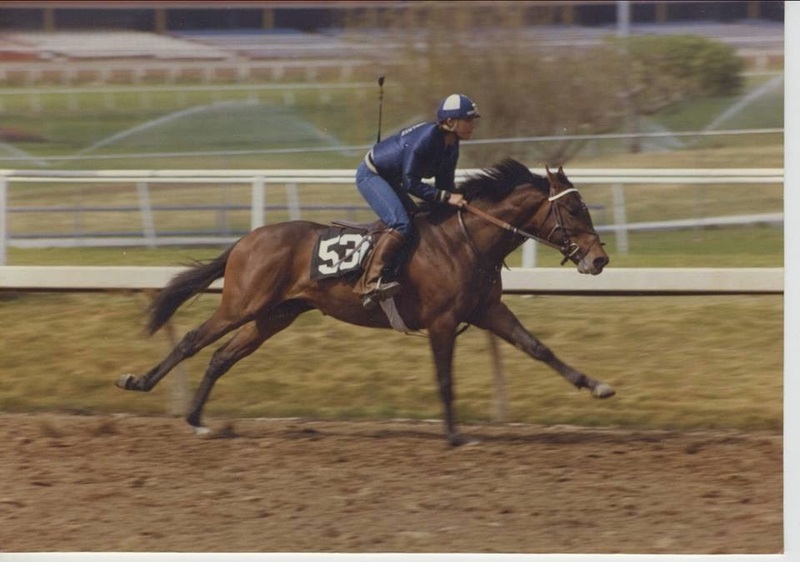 Breezing a horse at Santa Anita racetrack. She is not a breedist – she welcomes any kind of horse into her program. From quarter horses to paints to polo ponies in addition to the more common TBs and warmbloods – she welcomes them all. She doesn’t think I’m crazy for having a future goal of eventing a saddlebred. She is honest. Sometimes brutally honest. But better than trainers who give lip service. She has a great attitude. A brilliant smile after falling off into water at an XC school. She believes in teaching the horse to think for himself, and get himself out of trouble. She believes that a horse should be happy and confident in his job. She genuinely cares about shows being positive outings more than a chance to get some ribbons. Showing with her does not have the same level of pressure that I’ve experienced when riding with trainers who care strongly about their clients placing. Sounds like a great trainer. I agree its nice to have a trainer who pushes you to grow, but doesn't freak if you're not bringing home ribbons by the barrel. Those are some impressive pics. Obsessed with that fourth photo. So cool! Sounds like a great trainer! 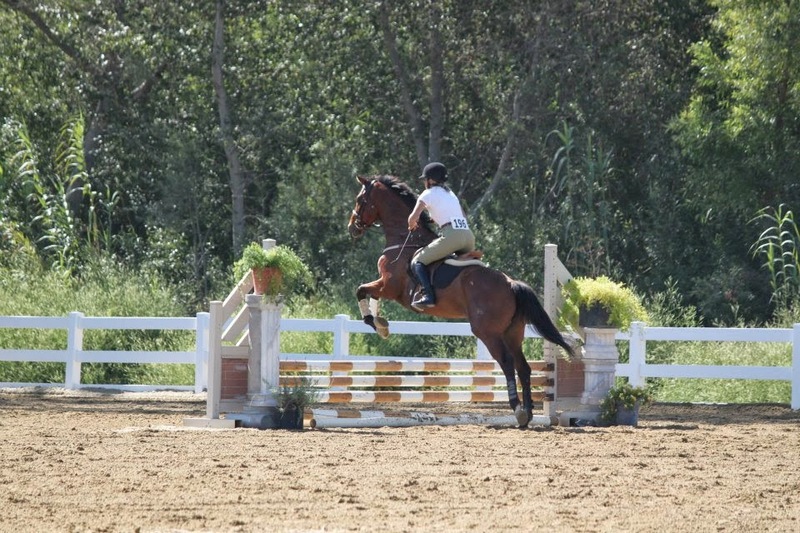 Also, it's cool that she trains OTTBs for eventing because I someday want to event with an OTTB. 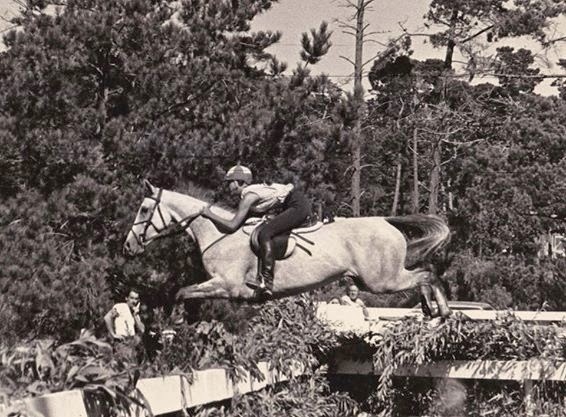 Nice…love those trainers with Thoroughbred skills! Thank you! This was a well-timed blog hop. I needed this reminder that my trainer is awesome because I just had a few bad lessons and was feeling mopey. Agreed. I like her healthy attitude towards shows. Ribbons are just a bonus in her eyes. Yeah, I'm very lucky I found her. She doesn't advertise – it was through random friend-of-a-friend situation that I even heard of her!